View the Hebrew text and its English translation simultaneously. ArtScroll's patented arrow system gently guides the eye, directing it in the proper direction. Want to know just what a word or phrase means? Just look down, follow the arrows, and continue reading! Finally, you can understand them as you say them! The Kinnos, the liturgical poems lamenting the destruction of the Temple, are haunting, beautiful, touching - and so hard to understand. 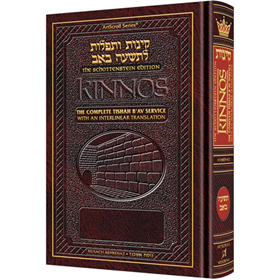 Now, for the first time, you can recite the Kinnos in Hebrew, and use ArtScroll's patented interlinear system to understand words and phrases.